Property has great commercial potential! This property is located just off of Ronald Reagan! Was previously zoned commercial but went back to residential zoning when the business closed. Possibilities are endless! 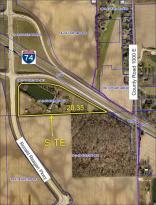 Brownsburg, Indiana is the perfect place in which to buy a vacant lot. With 32 listings out there, now is a great time to start looking at properties.